The initial public reaction questioned whether the photograph was real. The children seemed to be wearing school uniforms. Blue pullovers, grey slacks. But it was high summer. The schools were closed. So, was it fake, this photograph which filled a slow news day vacuum in another silly season? Or was it an old photograph, taken before, released now to manipulate the news and political agenda? No, it quickly emerged - the photograph was in real time. Shortly after that confirmation, the public reaction gave way to inner prejudices, deeply held and more insidious. The family were of the Travelling community. In some way this disclosure seemed designed to lessen the sense of guilt or shame. They were only Travellers; no home to go to. Quickly it was confirmed that they were settled, their home, or former home, or accommodation, sold to a vulture fund, it was said. It was at this point that the reaction went into overdrive: So, who was really responsible for this anyway? Have a look at the open sewer that is social media. The parents were responsible. The mother: why have seven children when you can't afford to keep seven children? Neither parent was working, it was noted. The "taxpayer" would have to "hand them a house". Where was her extended family, it was asked: the children's grandparents; and her friends? The response to which cited every prejudice in the anti-Traveller handbook. And have a look at her Facebook account while you're at it: cans of beer, fake tan and, inevitably, a flat-screen TV. The social welfare system was responsible, it was said. Somebody estimated, on the back of an envelope, that the mother would receive around €3,000 a month in "handouts", excluding (I think), a Housing Assistance Payment. The mother was "gaming the system". Elsewhere, somebody who knows a man who, apparently, knows about these things estimated that, leaving aside "extras", the mother was receiving €42,852 a year from the "system", cash in hand, or around €80,000 to the taxpayer equivalent. And they can't afford a house? Elsewhere again, somebody seized on the official line, published earlier in the week, that refugees who bring families to live in Ireland were putting pressure on homeless services. Inevitably, the blame would turn to immigrants and refugees, taking up taxpayer-funded accommodation that should go to the native Irish first. In the pecking order, it would seem, immigrants are lower down the social scale than Travellers, who themselves are below your standard "scrounger" on social welfare. And on it went, the blame game, the general public, the "squeezed middle" that would not be held responsible for this, who would refuse to be fooled, manipulated or duped by the do-gooders. 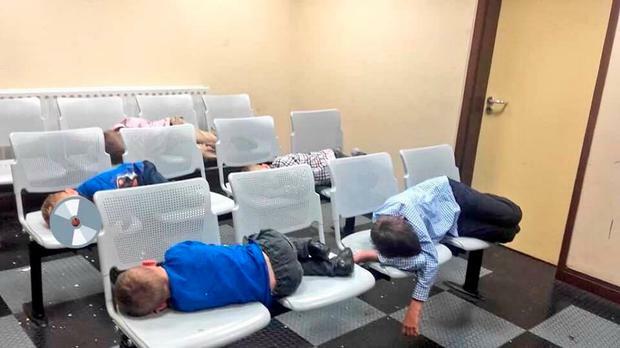 Or who would turn most vociferously, viciously indeed, on a mother and her children who had left it too late to seek emergency accommodation for the night and were forced to sleep on plastic chairs under the bright lights in a Garda station. In the morning, to their credit, a garda, or gardai in Tallaght took it upon themselves to provide the family with a hot breakfast. Small mercies. They say "homelessness" will be an "issue" in a general election, but I have my doubts. Or not in the way you might ordinarily imagine. The political system is attuned, fine attuned to the doubtful, questioning, bitter voices which responded to that photograph. Leo Varadkar sailed to the leadership of Fine Gael, and the country, partly on the back of what has been called a "dog whistle" to those who question the value, or suppose the abuse of social welfare. The Fine Gael orthodoxy is to allow the "markets" sort out the mess that is housing policy. In decades past, Fianna Fail put in place a policy of social housing from whence came many of the "squeezed middle". Now that party, too, dithers while Fine Gael experiments with cold, hard orthodoxy. And Sinn Fein calls out Fine Gael and Fianna Fail, but holds back in pulling a confidence trigger that would cause an election, to let the public have their say, the outcome of which Sinn Fein cannot predict in the din of shocking, shrill voices raining down on the heads of homeless children. Last Wednesday, RTE showed The Big Short, a brilliant 2015 film on mavericks in the world of high finance who predicted the credit and housing bubble collapse of the mid-2000s. "I have a feeling, in a few years people are going to be doing what they always do when the economy tanks. They will be blaming immigrants and poor people."